Preventative Maintenance Support Services Company specializes in professional residential and commercial parking lot sealcoating and asphalt striping in Palm Beach, West Palm Beach, Boca Raton, Lake Worth, Delray Beach, Manalapan and surrounding communities. Parking lot sealcoating is the process of covering your asphalt driveway or parking lot with a protective liquid called “sealcoat.” Sealcoat can greatly extend – and often double – the lifespan of asphalt by sealing oil back into your surface and slowing the oxidation process that dries and cracks asphalt over time.Asphalt oxidation is sped up in South Florida due to the high levels of rain as well as heat and UV exposure from the sun. Because asphalt is an oil-based product, it also gets damaged over time by chemicals dropped on the surface by cars. Gasoline, oil, coolant and other chemicals will speed up the deterioration of your driveway or parking lot. To maximize your asphalt’s lifespan, we recommend annual or bi-annual sealcoats. Cracks and potholes have been filled prior to the sealcoating process where required. The sealcoat is applied at the proper temperatures. The sealcoat is applied evenly and consistently across all surfaces including slopes and grades. The underlying surface is thoroughly cleaned and prepped. Weather forecasts ensure the sealcoat will have adequate drying and setting time. Careful attention is paid to edges and boundaries to give your surface a professional look. 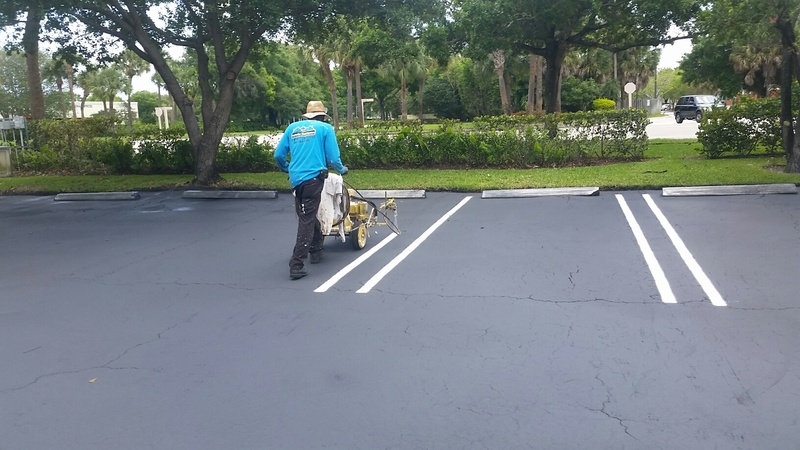 Crackfilling and professional parking lot sealcoat applications help protect your surface from the extreme weather it faces in South Florida. 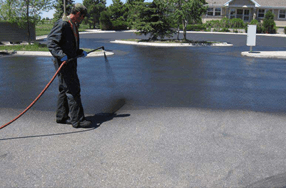 Preventative Maintenance Support Services Company offers professional asphalt repair and sealcoating in Palm Beach, West Palm Beach, Boca Raton and surrounding communities. We are licensed and insured, use superior quality materials and offer an extended warranty on all of our asphalt services. parking lot striping involves painting lines, stencils or other signage onto an asphalt surface or curb. Asphalt striping is typically done on large asphalt parking lots to control the flow of traffic, delineate parking spots and fire lanes, and direct traffic in and out of a parking lot. We can stripe new parking lots or rejuvenate faded lines on older lots – a problem that’s common in sun-drenched South Florida communities including Palm Beach, Lantana, Boca Raton and the surrounding municipalities. Our extended warranty ensures you’ll be happy with the quality of our materials, the accuracy of our lines and the improvement in your lot’s appearance. To ensure our asphalt striping is of the highest quality, we use high-quality striping machines and high-quality paint. All of our asphalt and asphalt striping work is licensed and insured.